Popular Hollywood cinematographer and English pop songs cinematographer Joseph Labisi worked to film a song in Stylish Star Allu Arjun’s Naa Peru Surya- Naa Illu India. A chartbuster number ‘Lover Also And Fighter Also’ was shot recently in USA. The famous D.O.P. Joseph Labisi worked as cinematographer for the song. Although Joseph Labisi began his career with the famous Hollywood films The Movie Hero, The Reaper, he used his skills particularly to shoot pop albums. He worked with famous pop singers like Ariana Grande, Enrique Iglesias and Nicki Minaj. We all know, how popular Nicki Minaj across the globe. Overall, Joseph Labisi worked as cinematographer for more than 40 English pop albums. Naa Peru Surya film unit happy for Joseph who has such an international profile worked for their film. For more than 20 days, they scouted locations to shoot the song in Hollywood territory in USA. The visuals captured by Joseph for the song are impressive, says producer Lagadapati Sridhar. Another high-profile technician has worked for the song. The famous costume designer Ann Marie Hoang who designed costumes for many Hollywood pop singers like Jennifer Lopez has worked specially for this song. Ann Marie Hoang has also designed costumes for the popular pop singer Nicki Minaj. Producer Lagadapati Sridhar expressed his happiness for working with such high-profile technicians for the song. Anu Emmanuel is leading lady opposite Stylish star Allu Arjun in the film directed by Vakkantham Vamsi. K Nagababu is presenting, while Sireesha Sridhar and Bunny Vass are producing jointly under Rama Lakshmi Cine Creations Banner. Currently the post-production works are happening at brisk pace. Soon, censor formalities will also be completed. The film’s audio jukebox will be released grandly on April 22. 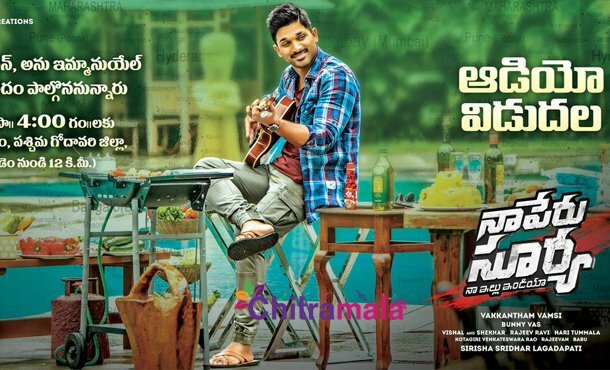 Audio function that will be attended by Allu Arjun will be celebrated in Military Madhavaram. Bunny will also meet the military persons and their families on the day. Pre-release function is scheduled on April 29th. The film is slated for release worldwide on May 4.